After the death of Moses the servant of the Lord, the Lord said to Joshua son of Nun, Moses' assistant: "Moses my servant is dead. Now then, you and all these people, get ready to cross the Jordan River into the land I am about to give to them--to the Israelites. I will give you every place where you set your foot, as I promised Moses. Your territory will extend from the desert to Lebanon, and from the great river, the Euphrates-- all the Hittite country--to the Great Sea on the west. No one will be able to stand up against you all the days of your life. As I was with Moses, so I will be with you; I will never leave you nor forsake you. Then an angel of the Lord appeared to him, standing at the right side of the altar of incense. When Zechariah saw him, he was startled and was gripped with fear. But the angel said to him: "Do not be afraid, Zechariah; your prayer has been heard. Your wife Elizabeth will bear you a son, and you are to give him the name John. 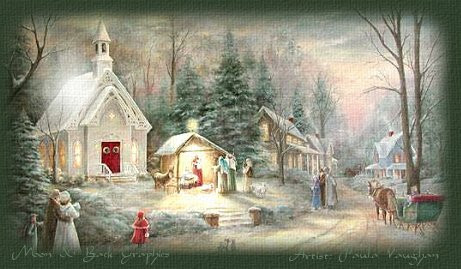 He will be a joy and delight to you, and many will rejoice because of his birth, for he will be great in the sight of the Lord. He is never to take wine or other fermented drink, and he will be filled with the Holy Spirit even from birth. Many of the people of Israel will he bring back to the Lord their God. And he will go on before the Lord, in the spirit and power of Elijah, to turn the hearts of the fathers to their children and the disobedient to the wisdom of the righteous--to make ready a people prepared for the Lord." If we want to be set free, we have to recognize our faults and regret them. We recognize our faults when we learn what sorts of things are wrong, see them in ourselves, admit them, take responsibility for them, and criticize ourselves for them. When we do this in front of God, we are recognizing our faults. We regret our faults when, once we have admitted them and asked with a humble heart for help in giving them up, we stop acting on them and start living a new life in harmony with the rules of kindness and faith. It may seem a little strange to be reading the story of Joshua as the Advent season begins. And truth be told, the reason we're reading this story today is that it just happens to be where we are in the Sunday School lessons as we follow the Dole Bible Study Notes, Series 2. But the more I thought about it, the more appropriate this story seemed for the beginning of Advent. And just so you don't think I'm cooking this all up out of my hopeful imagination, I have a little piece of Bible trivia for you: If the New Testament had been written in Hebrew instead of Greek, instead of celebrating the birth of the Lord Jesus Christ at this season, we would be celebrating the birth of the Lord Joshua Messiah. That's right! "Jesus" is the Greek form of the Hebrew name Joshua! When the angel appeared in a dream to Joseph, Mary's fiancé, to reassure him about the baby that Mary had conceived without Joseph's help, the angel told him, "She will give birth to a son, and you are to give him the name Jesus, because he will save his people from their sins" (Matthew 1:21). The name Joshua, and the name Jesus which comes from it, both mean "the Lord is my salvation." So you see, there is a very clear connection between Joshua and Jesus--and that connection has to do with the Lord's saving power in our lives. As we arrive at today's story about the Lord's call of Joshua, the Children of Israel have already been saved by the Lord from their slavery in Egypt. Over the past month we have followed their progress after they crossed the Red Sea. They traveled through the desert, grumbling and complaining the whole way! Last week we discovered the consequences of their unwillingness to trust in the Lord and have the courage to face the enemies that stood in their way: instead of going right in and conquering the land, they were consigned to wander in the desert for forty years, until all those timid doubters had died off. Even Moses, who had led them out of their slavery in Egypt and brought God's laws to them from Sinai, had to die before the people could enter the Holy Land. Joshua, who had been their military commander throughout all their battles in the desert, now took over from Moses as their leader. And today we heard the Lord's charge to him as he prepared to lead the Israelites in the many battles they would face in conquering the land of Canaan, their Promised Land: "Be strong and courageous. Do not be terrified; do not be discouraged, for the Lord your God will be with you wherever you go." If we read farther in the story, we would find that this time, the people were ready to follow him into battle. Unlike their parents, they were strong and courageous. They trusted in the Lord, and were ready and willing to follow where God led them, even if it meant facing fearsome enemies in Canaan. They had learned this trust growing up in the desert, where the Lord provided for their every need, and was with them as they overcame every enemy in their path. What does all of this have to do with the birth of the Lord Jesus? Our reading from the Gospel of Luke helps to make the connection. As we move through the Advent season toward Christmas, we tend to focus on the stories of Joseph and Mary, the birth of Jesus in the stable, the shepherds, the wise men. And sometimes we forget that before any of these stories took place, there was the story of the birth of John the Baptist, who would prepare the way for Jesus. When the angel Gabriel foretold his birth to Zechariah, he predicted of this baby to be born that "he will go on before the Lord, in the spirit and power of Elijah, to turn the hearts of the fathers to their children and the disobedient to the wisdom of the righteous--to make ready a people prepared for the Lord." To make ready a people prepared for the Lord. John the Baptist was to fulfill the prophecy with which the Old Testament ends: "See, I will send you the prophet Elijah before the great and dreadful day of the Lord comes. He will turn the hearts of the parents to their children and the hearts of children to their parents, so that I will not come and strike the land with a curse" (Malachi 4:5, 6). If we are not prepared for the Lord's coming, this time of year can become a curse to us, also. For many adults in this society, the Christmas season has become a hectic blur of excess activity and overspending. For these people, the celebration of our Lord's birth--the greatest spiritual event in all history--has been reduced to a material and commercial event whose main feature is how much stuff you can give, how many parties you can go to, and how much food you can eat. This kind of Christmas quickly becomes a curse as we pay the price in the burden of debt after the splurge of spending, the physical sickness that comes for so many after the Thanksgiving and Christmas feasts are over, and the growing sense of Christmas as a treadmill that just keeps coming around every year whether we like it or not. These are some of the results of making Christmas a material event rather than a spiritual one. At a deeper level, if we are not prepared for the Lord's coming within ourselves, in our souls, his continuing presence behind all the outward show of Christmas will become for us a curse instead of a blessing. If we are not open to a new and deeper presence of the Lord in our hearts, minds, and lives, then even the message of the Lord's birth right out of the Bible will ring hollow for us. We will see others moved by the beauty and power of Jesus' birth, but we ourselves will feel a sense of skepticism and even cynicism. We will be unable to open ourselves to that new birth. Therefore we will begin to think of it as a fantasy--a child's story that we "mature" adults have outgrown. We may even wish that we could feel the power of the Advent story, and become sad because we cannot. For us, the deeper magic will be gone from Christmas. Jesus will not be born in us this time. How do we prepare ourselves for the Lord's birth, lest the inner land of our souls be struck with a curse? How do we "make straight in the desert a highway for our God"? (Isaiah 40:3). Both John the Baptist and Joshua remind us that this is not an easy task. The coming of the Lord is a "great and terrible day" for the parts of ourselves that we must leave behind in order to make ourselves ready for the Lord to be born in us. We are called to do nothing less than begin a whole new life, leaving our old life behind. "A voice of one calling in the desert, 'Prepare the way for the Lord, make straight paths for him. Every valley shall be filled in, every mountain and hill made low. The crooked roads shall become straight, the rough ways smooth. And all mankind will see God's salvation.'" John the Baptist was an austere man, and he used strong language in order to shake the people out of their complacency and motivate them to leave behind their old rough and crooked ways, to straighten out their lives and smooth down the jagged edges of their faulty attitudes and actions. He knew that unless the people's hard hearts were softened, and they were ready to come with humility, admitting their wrongs--their sins--they would never accept the greater and deeper teachings of the Lord into their hearts. He knew that unless they repented from their current ways; unless they recognized that they were thinking, feeling, and acting badly; unless began the hard work of changing their ways, they would perceive the Lord's message as a threat instead of as a blessing. And indeed, those who did not listen to John's message did not listen to the Lord's message either. Instead of welcoming Jesus' teachings with open arms, as the common people did, they considered him a heretic and a blasphemer, and eventually had him killed in order to avoid the power of his words and deeds. In doing so, they brought down upon themselves all the curses found in their own scriptures--including the destruction of Jerusalem, their sacred city, and the scattering of their nation throughout the then-known world. These are the spiritual consequences for us, too, if we are not willing to look within ourselves and take a moral inventory of our attitudes and actions as we prepare for the Lord's coming. Yes, the coming of the Lord is good news of great joy to all the people. But if we remain stuck in our old and faulty ways, our ears will be closed to that good news. Turning back to the story of Joshua, we find that when the Lord calls us to new ways of living, there is a huge task in front of us. It is a task that will involve many painful struggles, and will cause the death of some of our cherished beliefs and habits. The Lord's call to Joshua came just as God was about to lead the children of Israel into battle. Yes, the Holy Land had been promised to them. But they had to conquer their enemies in the land in order to receive the fulfillment of that promise. These days, we no longer think of literal war as an acceptable and valid way of enlarging our territory at the expense of those already occupying it. But there remains one vast territory where we must fight many battles in order to gain control. It is the territory of our own hearts and minds--of our own spirits. When we first hear God's call to leave behind our old ways and begin a new, more spiritual way of life, we may imagine that it will be an easy matter to learn what the Lord teaches in the Bible, and put it into practice in our lives. But it is not long before we realize that our hearts and minds are already occupied by forces hostile to the Lord's new presence in us: self-centeredness, laziness, fear, depression, self-righteousness, blaming of others, greediness, apathy, unfaithfulness, jealousy, faint-heartedness. The list goes on and on of terrifying spiritual enemies that we must face and overcome before we can occupy the promised land in our own souls. There is no other way to enjoy the spiritual peace and prosperity that comes to us only when God is the unchallenged ruler of our entire life, from our deepest feelings to our most trivial everyday tasks. It turns out to be very appropriate to hear the story of Joshua's call as our thoughts move toward the new birth of the Lord into our lives. We have a lot to do between now and Christmas. Yes, there's all that shopping and cleaning and holiday preparation. But that's not what I'm talking about. The greater work ahead of us is the work of cleaning out the low and unworthy attitudes within us; of battling against the ways we are hurting one another and shutting the Lord out of our lives. We have an inner land to conquer in order to prepare ourselves for the new life that the Lord calls us to. But do not be terrified; do not be discouraged, for the Lord your God will be with you wherever you go. Be strong and very courageous in your spiritual battles at this season, and the Lord will give you the victory. Amen.